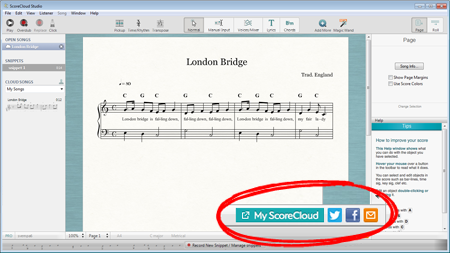 ScoreCloud is completely free to download so you can get started right away. We do also offer a free trial of the Pro Plan that gives full access to all features when signing up for any plan. Read more on the plans page. Sign in with Facebook or email. If you want, watch the introduction video. Choose “Play” in the welcome screen. Click “Record Audio” and sing or play something. Don’t know what? Try “Twinkle Twinkle” or “Yellow Submarine”! 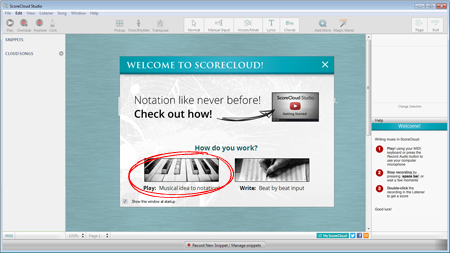 You can also connect a MIDI keyboard and play, or use the virtual piano to play on your computer keyboard. Your input appears in the “listener”. Analyze to get the sheet music! 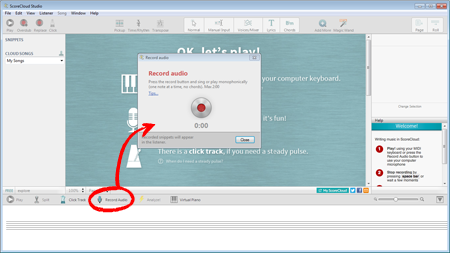 Click around and use the tools in the toolbar to edit the song, add voices, lyrics and chords. Hot tip: Try the Auto Chords button in the Magic Wand menu! Save your first song! You can choose to keep it private, or make it public for the world to see. Now you can share your song via email, or on Facebook or Twitter! Check out these songs shared by other users!